Danske Bank Fights Fraud with Machine Learning and AI | Constellation Research Inc.
Danske Bank is a Nordic financial services company that operates in 16 countries, serving more than 1,800 corporations and institutions, 236,000 small and midsized companies and 2.7 million personal customers. Starting in 2016, the bank saw an increase in fraud and, with that, an increase in transactions flagged as potentially fraudulent by the bank’s rules engine. 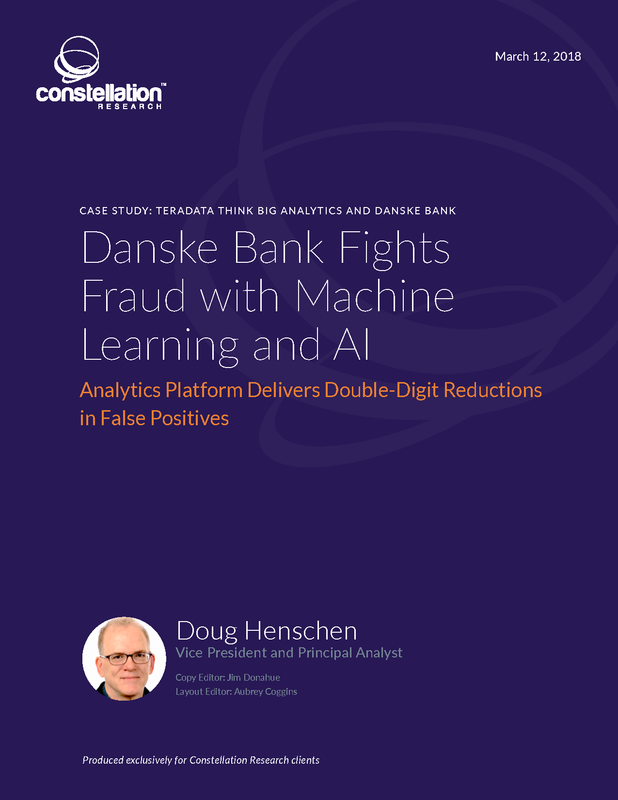 To reduce number of false positives—meaning legitimate payments flagged for verification—Danske Bank decided to enhance fraud prevention by applying machine learning (ML). The bank is also investigating applying deep learning (DL) to the problem. Executives wished to avoid commercial products and a siloed approach. Their vision was to use open-source technology and to gain expertise that could be applied in many use cases. Danske Bank was successful with ML proof-ofconcept projects, but it lacked experience in bringing these technologies into production. The bank turned to Teradata Think Big Analytics, the big data strategy, consulting and implementation unit of Teradata, which offered expertise and experience with similar highscale deployments at major financial services companies and other organizations. Working with Think Big Analytics consultants in 12-week development and operations (DevOps) sprints, Danske Bank’s team developed and deployed ML ensemble models that reduced false positives by 20 percent to 30 percent. DL models developed by the team also look promising. Based on TensorFlow, these DL models have yet to be put into production, but they’re demonstrating double-digit improvements in fraud detection and further reductions in false positives in a test environment.